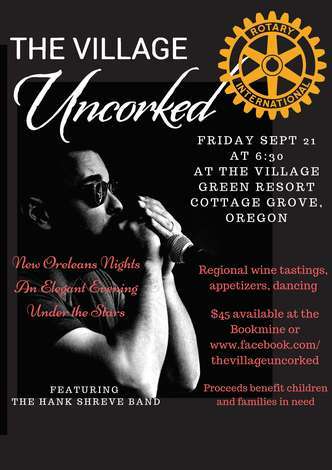 "All Proceeds Benefit Children and Families In Need Around The world"
The Village Uncorked, hosted by the Rotary Club of Cottage Grove. Join us for an elegant evening under the stars, with wine tastings, appetizers, and dessert. There will be an auction replete with regional wines and music at the Village Green Resort in beautiful Cottage Grove, Oregon. For groups of people wanting to ensure that they will sit together at the event but do NOT want to sponsor a table (8 settings), please buy individual tickets at the same table. Tables 11-16 are set up in the purchasing section to allow attendees to ensure seating with specific people. Each table is located in the gorgeous garden of the Village Green, and all tables will have glorious views. Table numbers do not vary by price, and are simply away to ensure parties can sit together. It may not be possible to switch seats at the event. If a wrong table has been chosen at time of purchase please contact event organizers right away to ensure we can move your seat to the correct table. If you would like to meet new people and do not have a preference where you sit, please select the Table - Undesignated tickets and you will be placed with new friends. This is a great way to meet new people in a fun environment.